Canine Influenza Virus (CIV) continues to be a problem in both the United States and Canada. About 20 confirmed and suspected cases have been identified in the Muskoka area in Ontario over the past week, and new cases continue to be identified in several US locations including Michigan, New York, and California. Few cases have been reported in the United Kingdom and Australia, although ongoing vigilance is of importance to identify and control this contagious disease. It is hard to tell exactly how many cases of CIV there are, as many dogs showing “flu symptoms” are not tested for the virus – the number of reported cases is likely an underestimate as many unidentified cases occur alongside reported cases. What is Canine Influenza Virus? Canine Influenza Virus is a highly contagious virus, much like the human influenza virus. There are primarily two strains of influenza that affect dogs: H3N8 (a strain originating with horses) and H3N2 (a strain originating with birds). H3N2 was first reported in Chicago in 2015. Since then several outbreaks have been reported throughout the US. January 2018 marked the first confirmed outbreak in Canada. The signs of CIV are similar to those of the flu in humans, and include cough, runny nose, fever, lethargy, eye discharge, and reduced appetite. When a virus enters a population that has no immunity from previous infections or from vaccination, the virus can spread quickly. This is the case with CIV. The virus is typically not fatal for healthy dogs. However, for senior dogs, puppies, or those with underlying health problems complications can occur, including more serious infections, such as pneumonia. Brachycephalic breeds (dogs with short noses and flat faces, such as Pugs, French Bulldogs, Lhasa Apsos, and Shih Tzus) are also at a higher risk for developing complications. There are approved CIV vaccines available in the United States and Canada. Just like the human ‘flu shot’ CIV vaccination is not a guarantee that your dog will not become ill. It does, however, reduce the likelihood and severity of illness. Like many vaccines, two doses are required about 2-4 weeks apart. Discuss the vaccination with your veterinarian to determine if your dog is at risk for exposure to CIV and if your dog should be vaccinated. you are travelling with your pet to areas where the virus has been reported. you or your dog is going to be in contact with dogs imported from areas where the virus has been reported. you show your dog and he will be in contact with dogs from other areas. your dog is in contact with a lot of other dogs (e.g., at puppy and obedience classes, doggy daycare, boarding kennels, and dog shows). your dog is in a high-risk group (e.g., is brachycephalic, elderly, very young, or has underlying heart or lung disease). you have dogs in a breeding kennel. If your dog is sick, don’t take him for walks or socialize with other dogs. If you are out with your dog and see a sick dog, stay away from it. 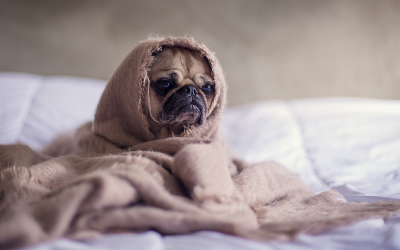 If your dog becomes sick after being in contact with other dogs (e.g., at puppy and obedience classes, doggy daycare, boarding kennels, dog shows, or any other events), contact the owner/operator. If you have been in contact with a sick dog, be sure to wash your hands and change your clothes. The virus can live on surfaces, such as your body and clothing, and the virus can easily be transferred from clothing to dogs. Contact your veterinarian if your dog is showing signs of infection, BUT let the clinic know that you suspect CIV! If your dog needs to be seen by your veterinarian, the health care team will need to take precautions in order to prevent the spread of the virus to other dogs in the clinic. Treatment may include cough suppressants. Antibiotics are not used to treat the virus, but may be needed if a secondary infection, such as pneumonia, develops. Your veterinarian will determine what course of action needs to be taken if your dog does have CIV. If your dog has signs of CIV or was diagnosed with CIV, it is very important to keep him away from other dogs for 4 weeks – even if your dog appears to have recovered after only 2 or 3 weeks. If canine influenza virus is in your area, don’t panic! Be aware of the signs and take precautions to protect your furry friend!